November 26, 2003 100 PDT (FTW) -- To those with long-suffering sacrifice in the field of assassination research, the fortieth anniversary of the death of JFK must seem like a bad dream that has finally ended. There are many lessons from the barrage of JFK anniversary programming, from JFK's death itself, and from the murder of his brother Robert, which show that physical evidence - as obvious and as glaring as it might be - has never before succeeded in overturning an established government lie in the minds of the people. That awareness was with me on 9/11 and it remains validated by experience in the post-9/11 world. I write this article in part to share the practical teaching experience offered by these events, to make amends, and to offer an apology. It was not possible to watch every program on every network that gave the American people and the world a dose of conditioning reinforcement about how it couldn't be definitively proven that Lee Harvey Oswald did not kill JFK, or that others did. At the end of a week of this confusing deluge, one was left with a message -- it was still likely Oswald, a long-dead progenitor of crazed, lone, twentieth century-gunmen, who did it. And if all the "experts" paraded; the scientific tests conducted; the computer simulations and photographic enhancements offered could not answer the questions: How could mere lay people find an answer? All talk. No justice. No change. There is a reason why I opened my video The Truth and Lies of 9/11 with a single segment from the Zapruder film, shot on November 22, 1963. 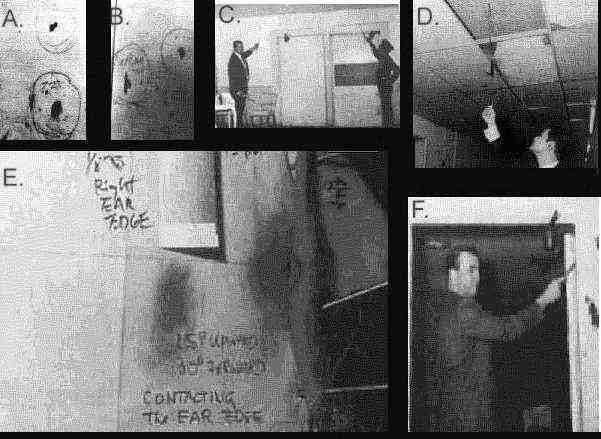 It shows that with the fatal head shot, JFK's body was pushed backwards and not forwards. In the simplest laws of physics this means one thing and one thing only; the shot was fired from JFK's front and hence, not by Oswald. The media conditioning - the "Mighty Wurlitzer" described by the CIA's legendary Frank Wisner - has done its job again. Anything that simple couldn't be true. We also have the magic bullet, that infamous concoction of Arlen Specter, then a junior counsel to the Warren Commission and now the Senior Senator from Pennsylvania. Go to Google. Type in "Magic Bullet JFK" and hit Search. More than 10,000 entries arrive for evaluation. Instantly, any clarity about what this magic bullet that inflicted seven wounds and - according to the Warren Commission report - performed physically impossible maneuvers, vaporizes into mind-numbing gridlock. Only by taking the actual text of the Warren Commission report, the photographs and medical records that have been released over the decades, and then comparing them, can a lone, crazed citizen arrive at any conclusions. Then, faced with 10,000 entries and the conventional wisdom created by a media machine that trades its stock on Wall Street, is dependent upon war profits (not to mention the laundering of $600 billion a year in drug money) and which cooks its books, the citizen must choose a painful road less traveled, or the path of political and social correctness. Now go to Google and enter "World Trade Center Collapse". One finds 497,000 entries to read. Granted, not all of these discuss how the towers came down, but most of them do. No, I did not read each one of them. It took 40 years for the world to produce 10,000 entries on the magic bullet and just two years to produce 497,000 on the World Trade Center. If one enters "WTC Tower Collapse" -- a bit more specific -- one finds 22,900 entries in just two years; more than twice as many as for the magic bullet in one-twentieth the time. Almost all of these described Google entries are private web sites and not those of the major media. As I have always said it would be, achieving definitive results to prove by using scientific research material that the WTC was brought down by something other than the air crashes, is a journalistic suicide mission if one measures success only as change accomplished in the political landscape. The historical corollary to JFK's front-to-back motion is the collapse of WTC Building 7, which was not struck by an aircraft at all, and yet it collapsed faster than gravity would permit---and perfectly within its own footprint. Inside that building were choice bits of history and evidence. Its tenants included the Internal Revenue Service, the Secret Service, the Securities and Exchange Commission, the Mayor's office of Emergency Management and the CIA's New York Station. (Source: http://www.serendipity.li/wot/7wtc.html) Nothing makes sense to explain the collapse of this building except controlled demolition. Yet go to Google again and enter WTC 7 and one finds more than 1,800 entries. In my opinion watching one film of the WTC 7 collapse says as much as JFK's front-to-back movement. Please see http://www.wtc7.net/videos.html. It is inconceivable that this building was brought down by planes that hit buildings approximately a hundred yards away. But are there common citizens who believe it? I have painful and personal connections to the June 1968 assassination of John Kennedy's brother Robert. I have recorded those connections for all to see at http://www.fromthewilderness.com/free/pandora/rfk.html. Having known several of the great RFK researchers like Jonn Christian, Bill Turner, Jim Di Eugenio and Lisa Pease, as well as the brother of RFK's alleged assassin Sirhan Sirhan, and Sirhan's lawyer, Robert Teeter, I still shudder inside when I think of the fact that it was absolutely proved that more than one gun was fired on the evening of June 5, 1968. The proof of that is as irrefutable as JFK's front-to-back motion. It consisted of photographs and sworn statements by eyewitnesses, LAPD and FBI personnel that there were bullet holes all over the place, many more than could be explained by Sirhan's eight-shot .22 revolver. Wounds in the various victims accounted for at least six shots alone. 9/11 physical evidence advocates will scream, "Hey, that's what they did with the debris from the World Trade Center! They took away all the evidence and destroyed it." That's right. That's exactly what they did. And in Bobby's case, an experienced and incorruptible scientist, then-L.A. County Coroner Thomas Noguchi steadfastly stood by his analysis of powder burns on RFK's head, which showed that the fatal wound was fired from "more than one and no more than three inches behind Bobby's right ear." Interesting, in light of the fact that none of the witnesses in the pantry that night placed Sirhan any closer than three feet directly in front of the man who had just secured his party's presidential nomination by winning the California primary. So, with all of this brilliant and unassailable physical evidence; evidence that any person on the street can look at and say, "That's just amazing. The official version can't be true," which of these conspiracies has been exposed, and how has the machinery of the US government changed, as a result of all the work done? In 1993 and 1994, I had my last foray into the activist world where I sought to oppose government corruption by using physical evidence. I became involved with a group of families (eventually reaching 109) of members of the US military who had committed "suicide" or died under mysterious circumstances. They came to call themselves "Until We Have Answers". Some victims had been shot in the back. Some shot with two different weapons. Some had allegedly committed suicide by hanging themselves with chords from pay telephones. Some were beaten. Others had been killed by bullets that could not possibly have been fired from guns they were holding. The medical reports from the Pentagon were beneath the level of a third grader trying to explain what had happened to his homework. The families were crestfallen, horribly offended, and full of rage. I sponsored an Indiana conference for some of those families. Notes were compared, strategies reviewed. New approaches were made to Congress. In the end, more than fifty members of the House and Senate signed a resolution tied to the appropriations bill calling for the Pentagon to reopen the cases. What happened? During summer recess, the DoD did reopen the cases and, in a matter of weeks, closed them all again with the exact same findings. When a new Congress arrived on Capitol Hill to read the "new" investigations, the deaths were "old business". All told, some of the families had spent as many as ten years and hundreds of thousands of dollars to achieve zero results. I still weep when I think of the hope I brought to some of those families that the undeniable physical evidence would secure them justice. I could cite a half dozen more cases where the physical evidence was overwhelming---and achieved nothing. But if the point is not made now it will never be made. "I don't for a minute believe that an airliner hit the Pentagon. And no one has ever seen a video of an airliner hitting the Pentagon because there isn't one. It doesn't look like the WTC towers collapsed because of the impacts and the way that they collapsed doesn't make sense. But if I, with some measure of journalistic credibility, and my readers on Capitol Hill and in universities start writing stories about these things, I wind up in either a journalistic suicide mission, or in the improbable place of having to explain where the airliner that didn't hit the Pentagon went or how the towers were brought down. There is a mountain of physical evidence that blows the government story in my mind, but my experience says that it will never penetrate the consciousness of the American people in a way that will bring about change. What will penetrate, from my experience, is taking non-scientific reports that most people instantly accept as credible, whether news reports or government statements or documents, and merely showing that they are lies. That opens the wedge, and removes any reliance upon expert or scientific testimony which is typically used to confuse simple facts. From there, you can begin to show people all the other documentary evidence of foreknowledge, planning and participation." On September 13, 2001, I hurriedly published a 241-word story on the FTW web site wherein I reached the early conclusion that explosives had not been placed in the World Trade Center. At the time, I based my conclusion upon several things. They included a detailed BBC report citing scientific sources and architectural experts saying that jet fuel running down the elevator shafts had been sufficient to cause the collapse; a detailed statement by New York architect John Young (still on the web) supporting these conclusions, and statements from my ex-wife Mary, an eyewitness who had seen the carnage from her Battery Park apartment nearby. Neither she, nor anyone she knew had heard any secondary explosions that might have indicated demolition charges inside the building. As the world was turning inside out, we all scrambled for reliable information in a place where nothing was to be trusted. It was like trying to stand sill in an earthquake. The BBC, because it was not American and held prestige, seemed like something that could be trusted - a straw in a windstorm. Whether accurate or not, I recognized that - much like the newspaper accounts appearing in Australia and New Zealand within hours of the Kennedy assassination that impossibly included Oswald's picture with statements that he was the assassin - for most of the world this avenue had already been closed off. I wish I would have said that then. As I published the brief bulletin, the entire weight of all of my experience with physical evidence was clearly in mind. I then promised my readers that I would follow up with more reports on the collapse. I never did, and I apologize. It has obviously created some confusion about what I really believe. Some advocates who want to push the physical evidence arguments have construed my failure to make additional reports as evidence of the fact that I am somehow a co-conspirator with the government in the 9/11 attacks and their cover-up. This is merely misplaced rage at something that is visible and accessible -- me. Some, quite correctly, have produced voluminous research showing that the melting point of steel - as originally reported by the BBC on September 12th, changed over the course of the next several days. It officially rose from 800 degrees centigrade to almost 2000 degrees centigrade and explanations about jet fuel being the cause of the collapse became harder to accept. I never read these stories, and was unaware of them until last week. I had already chosen my course of action and was devoting all my energies to that research. Even within those first few days I, and many other researchers who have tried to make a difference since, abandoned the physical evidence approach because collectively, we knew that it would be a much harder uphill struggle than the one we chose to pursue. In an avalanche of data, we all were picking and choosing what to focus on, knowing that it was impossible to focus on everything. Experience does teach those who have it. For the record - and I am certain that this will trigger a whole new round of media attacks against me for being a "conspiracy theorist" - I don't buy any part of the government's story. I speak here now as Michael Ruppert, the human being, rather than as the publisher and editor of an international newsletter with readers in congress and universities. What I believe is that on Septmeber 11th, many of the alleged hijackers were likely not even aboard the planes, and that it is possible that they were flown via (existing and well-documented) remote control technology. I believe that none of the alleged hijackers had acquired the proficiency required to perform the complicated maneuvers used. I do not accept the government's version of the collapses of the towers and WTC 7, and I believe that those collapses were caused by artificial means other than the aircraft collisions. The fact that there are credible mainstream reports showing that many of the 19 hijackers are still alive leads me to question the government's account further. But with the hijackers, one confronts what is called in the intelligence trade a "legend" of immense complexity that has not been definitively unraveled. I do believe that some of the 19 hijackers were aboard the four flights as tokens, and I am absolutely convinced that Flight 93 was shot down as some attacks were allowed to take place successfully, and others were prevented. This brings me to an artificial "straw" argument that has evolved from the controversy over physical evidence: Let it happen on purpose (LIHOP) vs. Make it happen on purpose (MIHOP). Again, for the record, as I have stated clearly on many occasions, I am absolutely convinced that the US government was a deliberate facilitator of the attacks before they occurred. I believe that the US government and its intelligence agencies - in cooperation with other intelligence agencies, especially the Israeli Mossad, Pakistan's ISI and Britain's MI6 - actively protected some of the 19 hijackers before the attacks, and made sure that they were free and allowed to circulate unmolested in order to fulfill the requirements of the "legend". One might include Russia's DFS and Germany's BND in this list, but the evidence here is inconclusive. My error, my failing, with regard to my story of September 13, 2001 was that I never went back to it and enhanced, explained or elaborated. I was already too absorbed in the task of exposing government lies via a different strategy in what I viewed - and still do - as a race against time. For this I apologize. My past experience with physical evidence was too painful and there had already emerged a group of wonderful researchers who had begun the fight that really mattered, the one that has made a difference, even if a small one. What has FTW's strategy accomplished? More than I would have thought. By focusing on documentary, non-scientifc lies and using as a starting point only official statements of the US government, hard records and reports from the government and established mainstream sources we have seen our arguments (i.e. the arguments of all who decided to follow this strategy) appear as a continuing controversy in major papers all over the world, including right here at home. My strategy put me in media venues as divergent as the opening segment on the Canadian Broadcasting Company's Fifth Estate (their equivalent of 60 MINUTES) and in the pages of the current issue of HUSTLER Magazine. Go to Google and search for warnings about 9/11. Of the 179,000 entires the first three are CNN and the Chrisitan Science Monitor. One also finds entries from The New York Times, the Washington Post, Newsweek, TIME and many other publications. That's a big difference from the magic bullet. I have always stated that the "independent" 9/11 commission would be a failure, and that it was intended to be a whitewash. But thanks to diligent efforts to slam the documentary (and unscientific) record in their faces by victim families, 9/11 Citizen's Watch and other groups and individuals, that commission has been forced to subpoena the FAA to find out why fighters were not scrambled on 9/11. It has been embarrassed to the point of threatening to subpoena the White House on foreknowledge, and it has now engaged in an inexcusable compromise to protect the incriminating secrets we know are there. We have forced admissions that Bush and his cabinet knew damn well that airplanes could be used as weapons, and we have seen damning revelations about how much the FBI, the CIA and the White House knew before the attacks. We have kept the government lying in ways that are self-evident. As long as we do that, we have a chance to make some real changes. The 9/11 commission will ultimately seek to conceal the truth, as its Executive Director Philip Zelikow tries to hide his massive conflicts of interest with Condoleezza Rice and the National Security establishment, but it must operate to some degree in public, or else its charade is wasted. And each time it compromises, waffles or lies, there are those like investigative journalist Tom Flocco who are right in its face asking why. So are many of the victim families of 9/11, who apparently have learned something from past experience - especially that of the families of Vietnam-era POWs and MIAs. We have kept the issue alive in the only place it matters, the public consciousness, and in the media that is used to shape public consciousness. The cards have been stacked against the truth from the beginning. We have taken the lemons handed us and we continue to make a bitter lemonade which we make the government drink each time they tell a new lie or add a new degree of spin to an old one. This is the methodical work of a trained detective, cross-examining a witness, and waiting for each new lie. This is the work of the seasoned journalist who digs and digs and digs to find the facts that some hired scientist can't explain away or dismiss. This is the work of the meticulous academic who seeks to reconcile fact after fact from obscure and hidden records. It is hard, backbreaking work. It is the past experience issue that is so diligently ignored by those newly awakened voices of opposition who expend needless energy debating whether explosives were placed in the towers, whether the planes were remote controlled, whether an airliner really hit the Pentagon, or whether maybe Congress will actually do something about any of it. These debates are worse than rearranging the deck chairs on the Titanic. They are expediting the demise of people who could otherwise be constructing life rafts. The proof already exists that the government lied. It may disappoint many to read now that I still hold that belief. In the same 2003 CBC program in which I was featured, the program's producers also interviewed French journalist Thierry Meyssan explaining his views that a Boeing 757 could not have hit the Pentagon. They immediately followed by stating that they had interviewed an "expert" who had satisfied them that a 757 did, in fact, strike the Pentagon. Without even naming the expert, they then dismissed Meyssan as a conspiracy theorist. What's past is future. Google entry number 17,301. We may not have the luxury of waiting forty years to see if the physical evidence advocates will have made a difference in the way the world works. Hell, we may not even have twenty. They are absolutely free to pusue any course of action they want and to listen - or not - to the people who have walked down that road before and found it unproductive. The fact is that the world is starting to run out of hydrocarbon energy, right now. Wars, famines, economic failure and plagues are upon us today. The children of the Bull Market are dying in Iraq and Afghanistan. The truth is that the real story - the only story -- is Peak Oil and Gas, and that 9/11 was its first visible manifestation. I fight to expose Peak Oil in part by exposing 9/11 in a way that registers in the public consciousness. That is my obligation to my readers and - as I see it - to my fellow man.